So, you think you don’t like blue fish? Well, after following these filleting techniques, you may very well change your mind. Mark Simmons recently shared his filleting finesse with me after returning from fishing for “blues,” and it sure was some tasty advice! Mark and his wife Merry live in Kinsey Cove, in Harvey Cedars. Mark has lived on LBI almost all of his life, and Merry was born and raised in Harvey Cedars. Mark, like so many residents and visitors, enjoys fishing Barnegat Bay. I visited with Mark the day he had just returned from fishing for “blues,” just as he was preparing to fillet his catch under two umbrellas. The umbrellas keep the area cool and prevent seagulls from getting a free lunch. Mark wasted no time educating me on how to fillet bluefish in order to ensure the best taste. After the fish are caught, they need to be put in a live well or, as Mark prefers, immediately on ice. In fact, he actually keeps them on ice through the entire filleting process. And it’s important to have the fillet table at a comfortable height. This prevents back strain. Over the years, Mark has settled on Corian for his table of choice. It doesn’t dull his knives as quickly as a stainless steel tabletop and is easier to keep clean than wood. Surrounding the workstation is a cooler filled with his recently-caught blue fish in ice water, a bucket for the carcasses, and a container with more ice for the blue fish fillets. There is also a hose set on the shower setting, hanging nearby and ready to spray the fillets and to wash down the work area when the job is done. Now, comes the finesse part. Follow Mark’s steps carefully and you, too, can prepare incredible blue fish fillets. Take one fish out of the ice water and place it horizontally on the filleting table, fairly close to you, in order to maintain the best control. 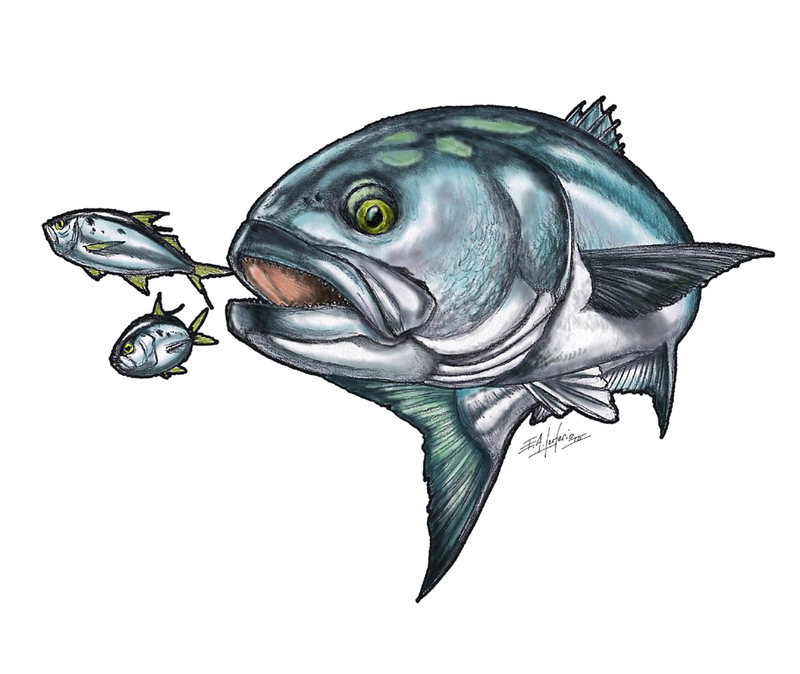 Grab the head, preferably by the gill (bluefish have teeth), securing it to the table. Now, with a sharp filleting knife, placed at a 45- degree angle behind the front fin, press down until you feel the skeleton under the knife. Turn the blade and flatten it over the skeleton, making a continuous, horizontal slice over the bones, toward the tail. You want to be close to the dorsal and close to the belly, without slicing into the stomach. Once that portion of the fish has been removed, immediately turn it over and rinse off the blood. Spray the work surface to get rid of any blood or slime and place the fillet, skin side down, off to the side of your clean work area or in another bucket of ice water. You’ll trim the skin from the meat later on. Turn over the fish you just filleted, spray the work area, and repeat the process on this side of the fish. Discard the carcass in a bucket and use it for crabbing in the bay. As Mark emphasizes, in order to ensure a quality fillet, do not allow the skin side or any blood to touch the meat side of the fish. There are now two fillets that need the skin removed. Spray the work area clean again and place the skin side down on the fillet table. Holding the fillet, slice into the meat so there is a piece that can be held while removing the skin from the meat. Using a continuous motion, pull the knife through horizontally, while simultaneously pulling the side you are holding in the opposite direction. Still holding the fillet, discard the skin in the carcass bucket and spray off any blood and scales from the fish and work surface.